SHOULD THE CBC DUMP DON CHERRY? The NHL is going through a very bad patch. It’s best player, crosby, is suffering from concussion. Three players are dead, two suicides. There is a groundswell to cut back on fighting in the NHL to avoid further serious injuries. 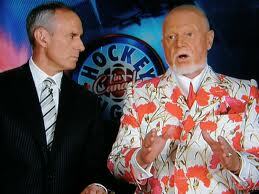 All are in favour of fewer injuries it would seem, except Don Cherry, the thug in CBC’s Coaches Corner. In a rant last week, Cherry singled out three former players calling them ” a bunch of pukes” because they publicly suggested those who fight in the NHL are more likely to turn to substance abuse. Frankly, I don’t think the CBC brass have the guts to shut cherry down. Besides his program, despite the rants, is a money-maker. Should the CBC shut down Don C herry?